Clear view and no more spilled fuel! Clear fuel bowl sight plugs are like having a ''window'' into your float bowl. They allow you to check and adjust your float/fuel levels without spilling fuel all down your carb and onto your intake manifold. These clear plugs really make this cumbersome adjustment much easier, faster and alot less hazardous. 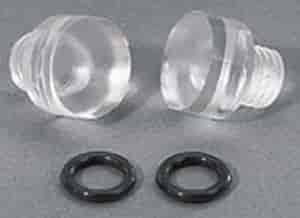 Each package includes two clear plugs with O-rings. .
65226 - Moroso Sight Plugs is rated 1.0 out of 5 by 1. Rated 1 out of 5 by tow truck from NO GOOD My old moroso plugs had been good for years. These didn't make it a day. Both broke. Put the brass plugs in.